The Jedi Knights were once the protectors of the galaxy, but after the Jedi Order was crushed by the Empire, these champions faded into legend. However, the ideals of the Jedi cannot be destroyed so easily, and new Guardians rise up to continue their predecessors' endless battle for justice, compassion, and honour. Begin your quest as a champion of the downtrodden with Keeping the Peace. 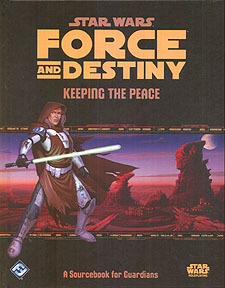 This supplement expands upon the Force and Destiny Roleplaying Game, adding new content for Guardians and any other characters who hear the call of justice in a galaxy of oppression. Draw your lightsaber to shield the meek, forge your own armour and become a hero whose legend transcends even death. Expanded character options including Motivations, Moralities, species, and specializations. New signature abilities and a new Force power to keep allies safe from harm. New lightsabers, armour, equipment, and vehicles for Guardians on patrol. Guidance for GMs on telling tales of heroism, triumph, and sacrifice inspired by the mythic roots of the Star Wars saga.